My sister-in-law for Lent gave up all things gluten…weirdly enough not something I had ever considered. I thought giving up all processed things in general was going to be hard-but I have to say watching her and listening to what she couldn’t eat (all grains but brown rice and quinoa, all flours unless specifically gluten free) was a tad bit harder then just saying a blatant processed. More thought went into her food preps and preparing then my veg and fruit, especially as she had to prepare foods for a three kids and one picky husband. 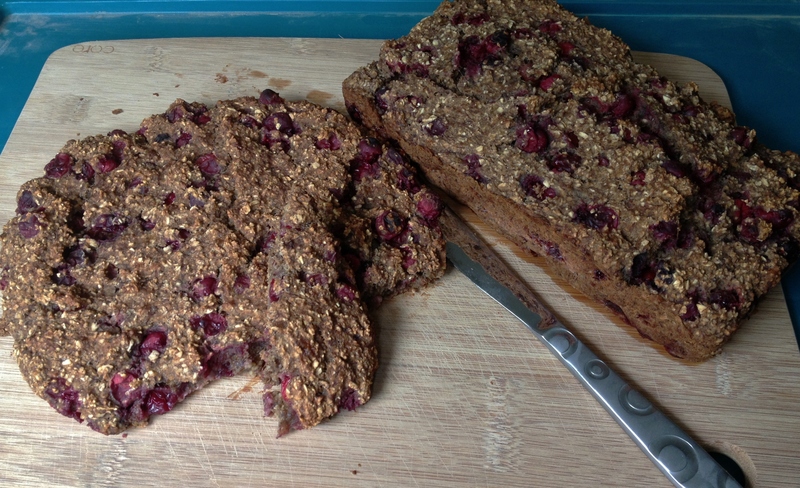 So this insanely long titled bread was an ode to her-Gluten Free, Vegan and Clean Oatmeal Banana Cranberry Bread . Let me first say, I had to text her to find out if she could even eat oats-she said as long as they were certified gluten free. Well mine were Quaker, and so are hers and she said she has yet to have an ill-effect from her so I went with it. Then I Googled how to bake with non-enriched flour and didn’t get any real good guidance, so I just loosely followed a Whole Foods banana bread recipe and pretty much just added extra baking powder to get it to raise. I am also super proud of myself for making my own flour! What! Make your own flour? So cool! 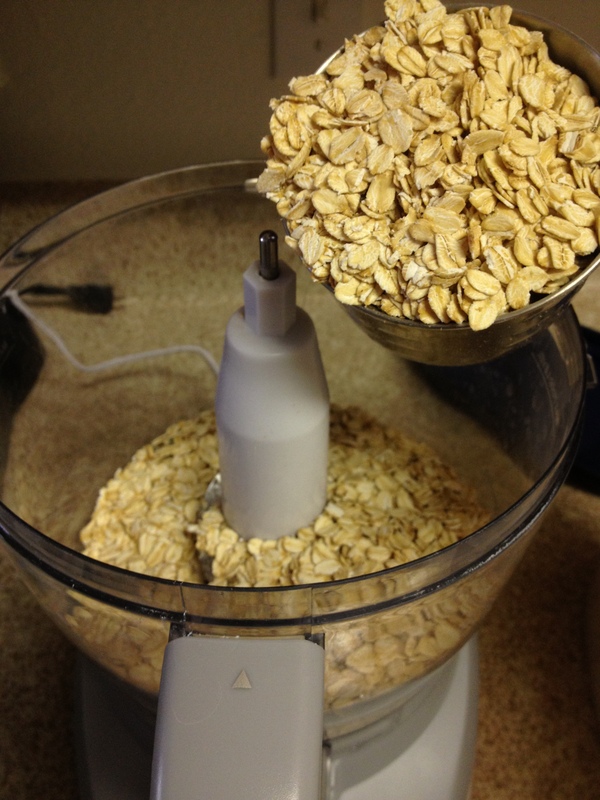 I got out my trusty food processor and dumped in two cups of old fashioned oats, and let it rip. I had read somewhere that you should let it rip for about 2 minutes to get the fine flour consistency but I have little to no patience so I think mine was only about 45 seconds. 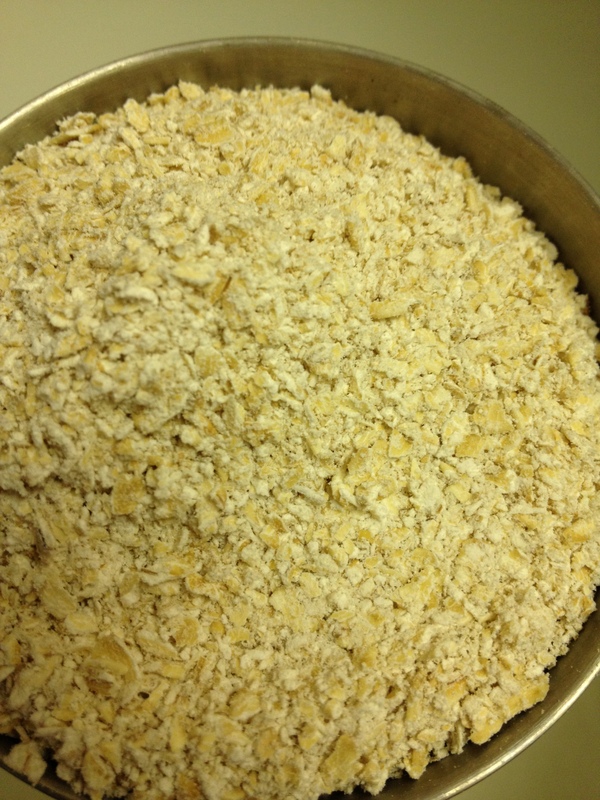 But it was perfect in my recipe-they were bigger grains so it was kind of like oatmeal cookie texture in the bread. 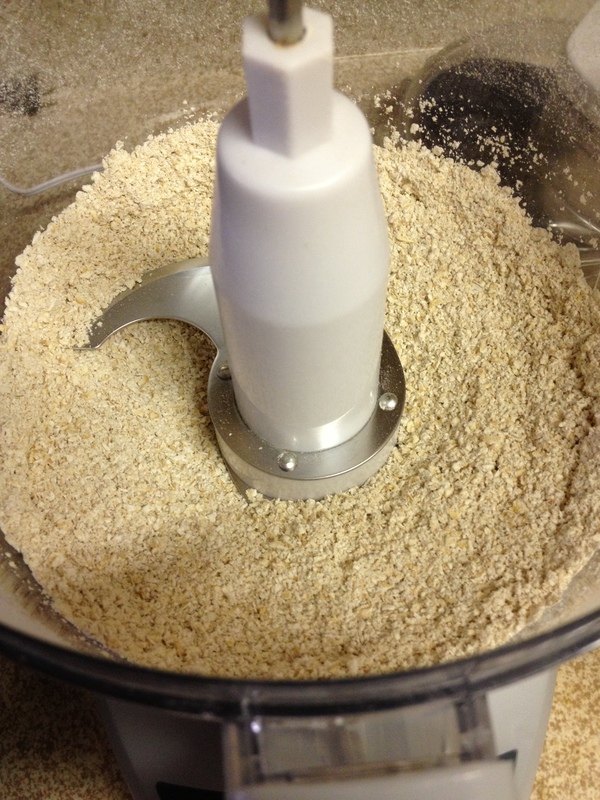 I love the oat flour-I would use this over wheat or white flour any day. 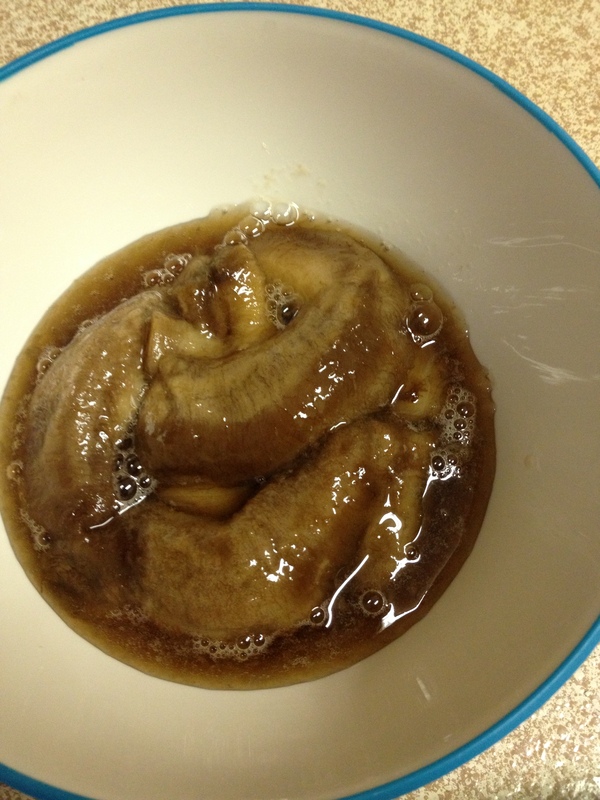 For the rest of the bread ingredients, which weren’t many, I wanted to maintain my sugerless lifestyle so I went with defrosted bananas (which are just plain ugly and gross looking once defrosted) and a few tablespoons of 100% pure maple syrup. The batter was so super sweet, but not overly so like a normal white sugar would be. The bananas natural sweetness was enhanced by the syrup. Yum. I just want to side not on the flax egg. I had never “flax egg”ed it before. 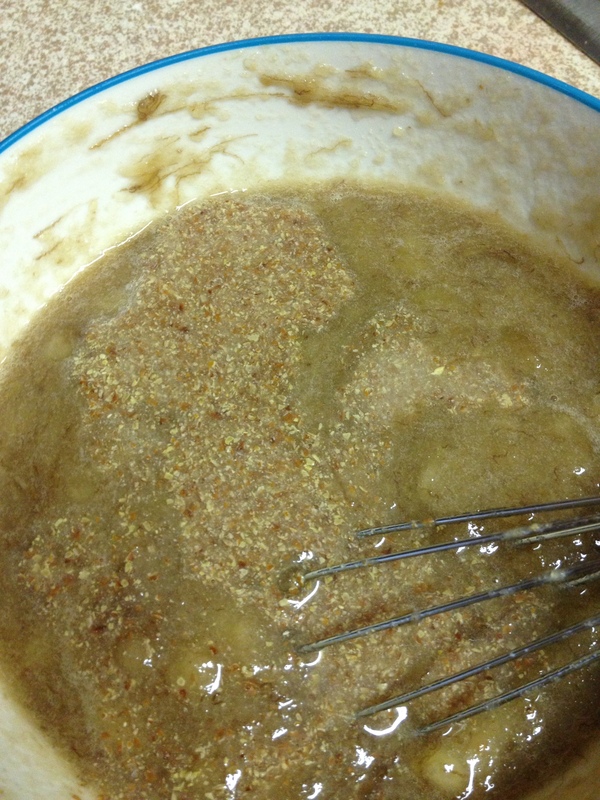 I normally just dump the flax into the dry ingredients and just deal with the batter. This time I used the trusty Google and found this guide. 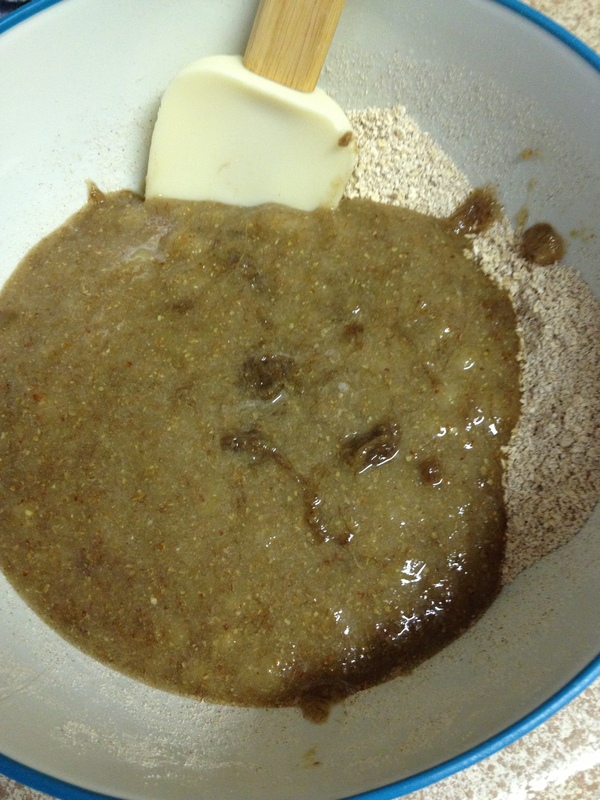 It said to mix the egg substitute this being a 2 egg recipe I used 2 tablespoons milled flax seed and 6 tablespoons water, stir then refrigerate for 15 minutes to one hour. Again little patience on my part I went for the 15 minutes but it had made a big difference in the flax seed-it had taken up the water. Very cool. 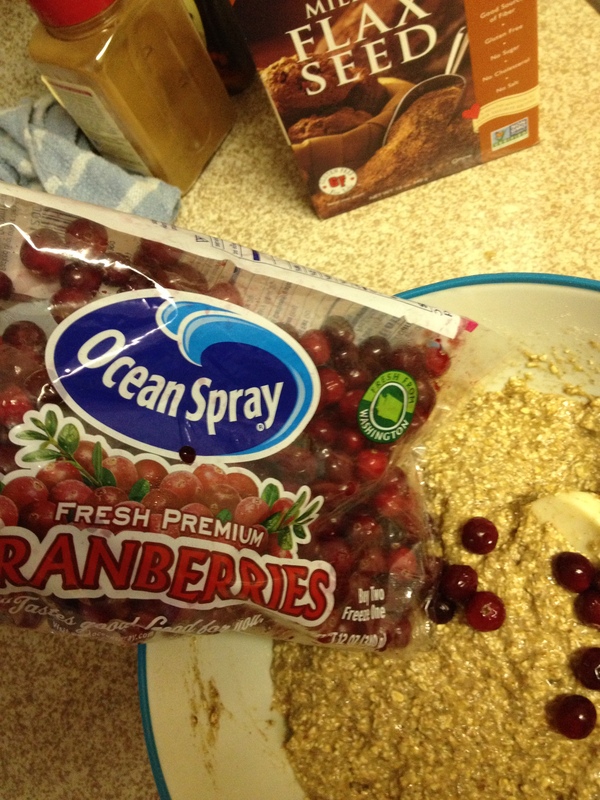 Also-the cranberries are very tart…if you aren’t into tart go with a fresh blueberry or good ole raisin for this bread. Or no fruit because the bread was great by itself! 2. 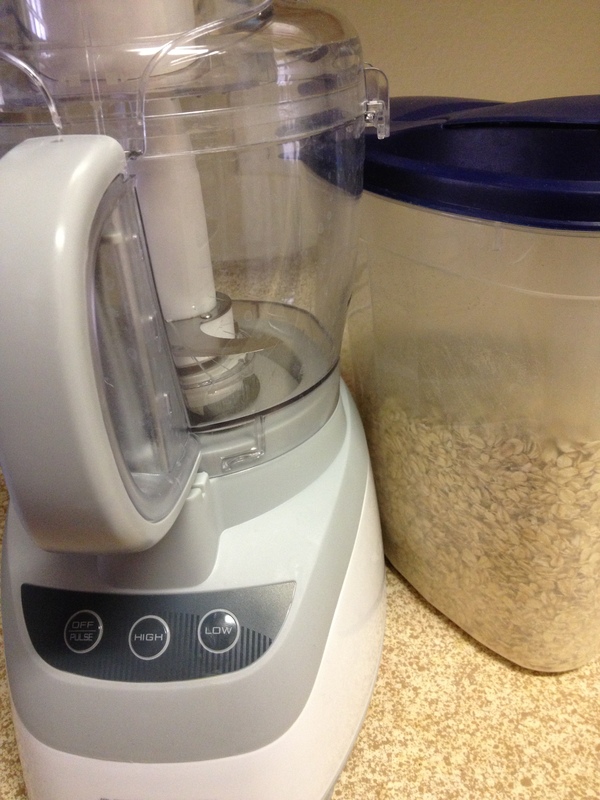 Dump 2 cups oats into food processor and let it go until desired consistency. 3. 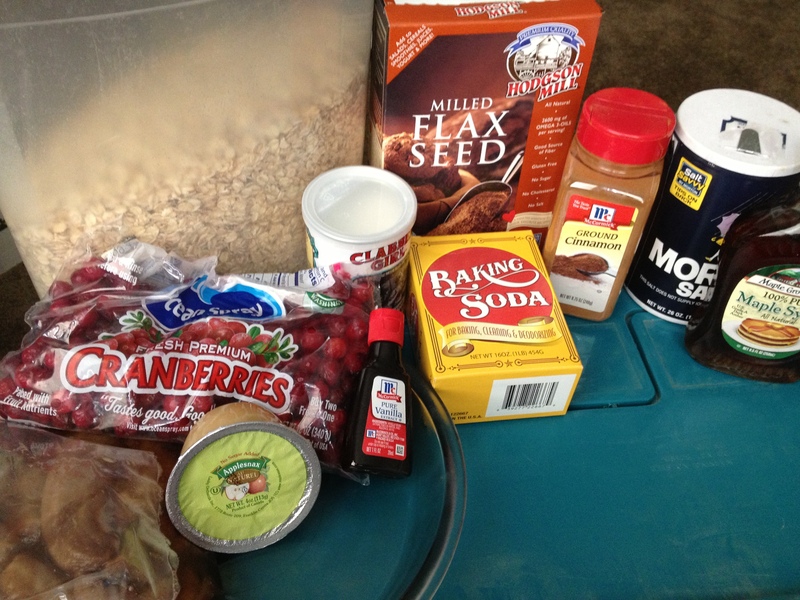 Blend flax and water in small bowl for 15 minutes. 4. 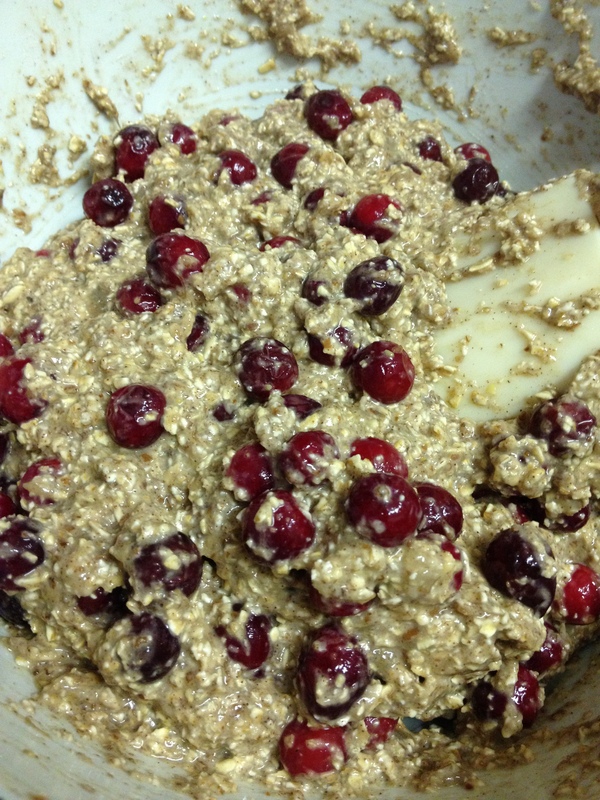 Pour oat flour into bowl and dump in baking powder, soda, cinnamon and salt-blend. 5. 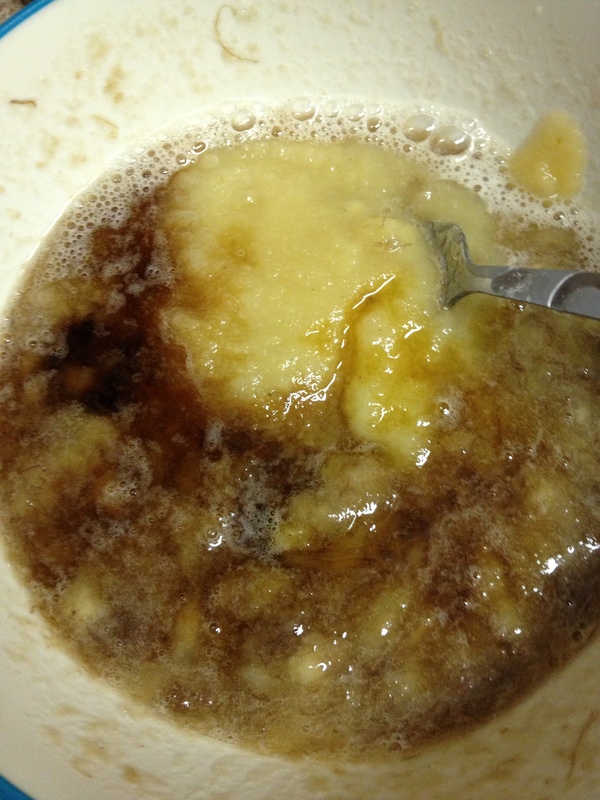 In another bowl mash defrosted bananas then blend in applesauce, vanilla maple syrup. 6. 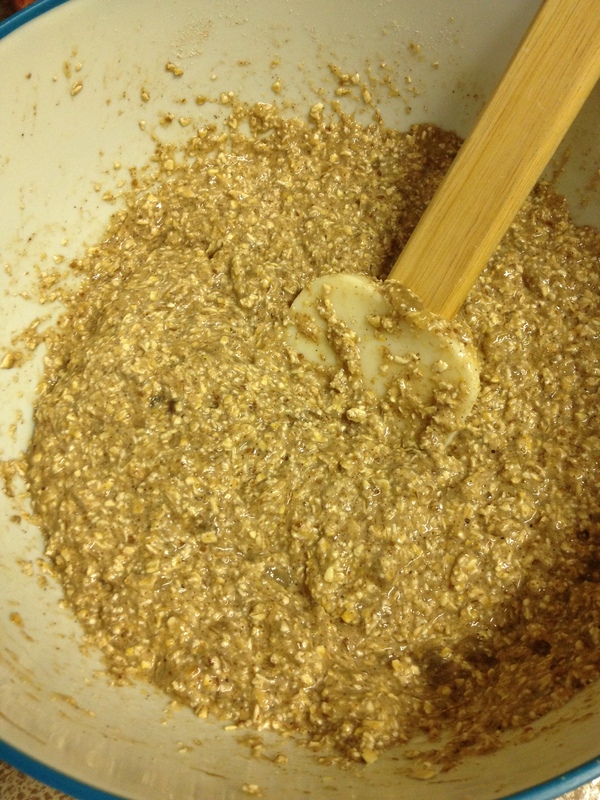 Add in flax egg and blend. 7. 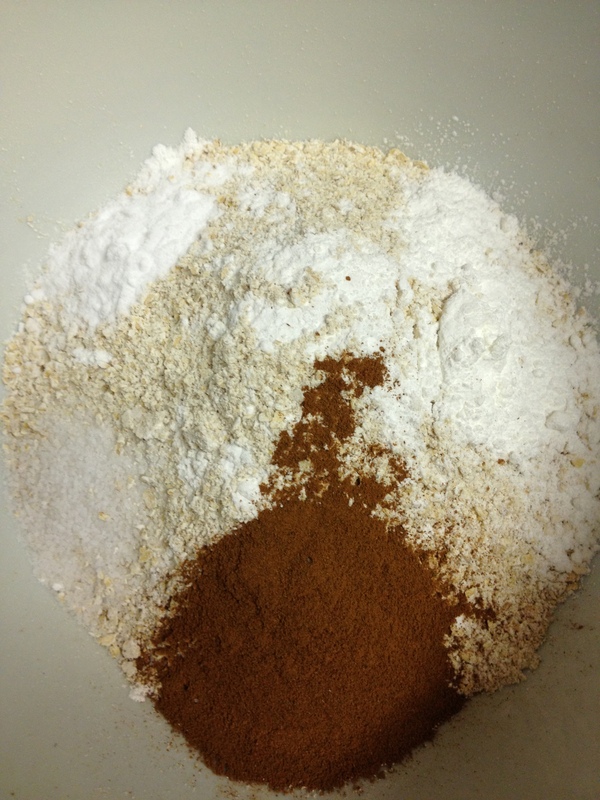 Pour liquid into dry ingredients and mix well. 9. 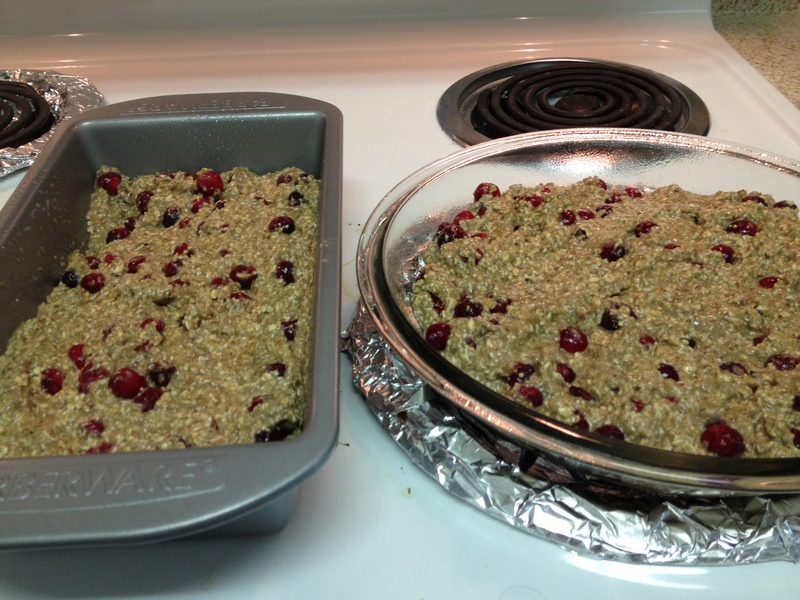 Pour into baking dishes and bake for 45 – 55 minutes.